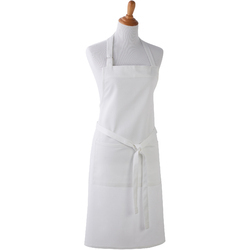 We present our comprehensive range of quality aprons, cotton aprons, cotton kitchen aprons. Made of quality fabric, these cotton kitchen aprons are available in stylish and attractive designs, ensure comfort, durable and can be used for many professional requirements.These Aprons are useful for daily usage. 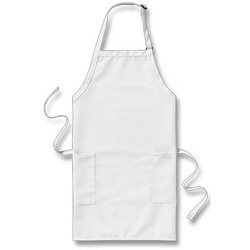 With the support of diligent personnel, we are offering a wide and superior range of Bib Aprons. 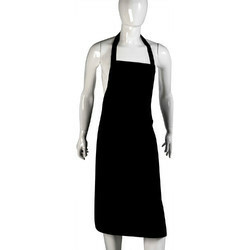 The bib aprons offered by us are developed using supreme grade cotton, which allow these to be utilized in the kitchen. This range is suitably offered with matching microwave oven hand gloves and also head cap. Also, these products are offered in different customized forms as per the diverse requirements of clients. Material : Poly Cotton With Nack Strap And Curve Bottom..
Colour : Natural / Black / Navy / Royal Blue. We are the manufacturer and exporter of Bib Aprons. To fulfill the diverse requirements of clients, we are delivering a supreme range of Mini Bib Aprons. These mini bib aprons offered by us are manufactured using high grade fabrics, sourced from the dependable vendors of the market. In addition to this, the offered range is acknowledged widely by esteemed clients, owing to its stylish patterns, perfect color mix and excellent finishing. Colour : Natural / Red / Green / Blue or any custom colour possible. Imprint : Silk screen printing available as per requirements. We are the exporter of Mini Bib Apron. Size : 15"w x 20"h.
Material : 8 oz poly/cotton. Colour : Natural or any custom colour possible. 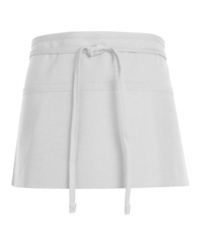 We are the manufacturer and exporter of Cotton Aprons. 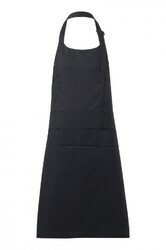 Our firm is a leading manufacturers and exporters of an unparalleled range of Cotton Cooking Aprons. The offered range is developed using supreme grade cottons, which is sourced from reliable vendors of the market. In addition to this, the offered range is available in different customized forms as per the diverse requirements of clients. These products are known for providing soft feel as well as normal feel fabric and are water resistant. Appx Size : 25" x 31 X 30" with Adjustable Neck Strap. We are the manufacturer and exporter of Cotton Kitchen Aprons. Owing to the wide distribution network, we are able to offer a wide and comprehensive range of Work Aprons. 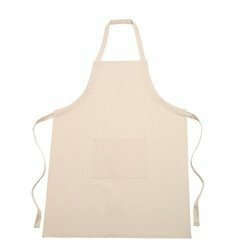 These work aprons offered by us are appreciated among the clients for their long lasting nature, soft texture, comfortable to wear feature and easy maintenance. In addition to this, the offered range is applicable in different residential as well as commercial sectors. Size : 24"w x 10"h with waist ties. Material : 8 oz poly/cotton material. Colour : Red / Green / Blue / Natural or any custom colour possible. We are the leading exporter of Work Apron. So as to cater to the diverse requirements of clients, we are engaged in delivering a wide and comprehensive range of Waist Aprons. These waist aprons offered by us are developed using supreme grade raw material, which is sourced from reliable vendors of the market. This range is widely used by butchers, grocers, waiters, bartenders, servers, chefs, cooks, kitchen and counter workers, gardeners, workers and allied workmen. Appx Size : 17"w x 12"h with Two Pockets. We are the exporter of Waist Apron.